This is not a post about delicious stained-glass, luscious woodwork, fabulous mantles, stunning architectural detailing, amazing vintage wallpaper, or anything of even the slightest aesthetic pleasure. Nope, this post is about particle board, pressure-treated lumber, concrete block, and spray-foam. So, for those with delicate visual sensibilities? It is strongly recommend that you skip this post and instead watch Downton Abbey. In my previous carriage house post I detailed the 1921 shed which had been added to the 1894 carriage house when it was converted into a house. The shed offered a kinda mid-century split-level spatial dynamic (cool name for a band: SPLIT LEVEL SPATIAL DYNAMIC). One walked a half-flight down from the kitchen to reach ground level. Then would could either go outside, or take another half-flight to the basement. The shed was kinda cool and interesting, but I carefully took it apart for reasons previously detailed. That was not quite two years ago. This removal meant that house bits which were not meant to be exposed to the elements WERE exposed. This also meant the the gutters high above, which had drained onto the shed roof, and then spilled to the ground, now drained onto the steps leading to the basement. And the basement, and steps, not meant to have rain pouring onto and into them, now had exactly that. With the 1,278,956 vital concerns about the Cross House restoration however, this issue was not at the top of the list. Then a person said they wanted to rent the carriage house, and issue 967,476 vaulted to the Top Ten List. 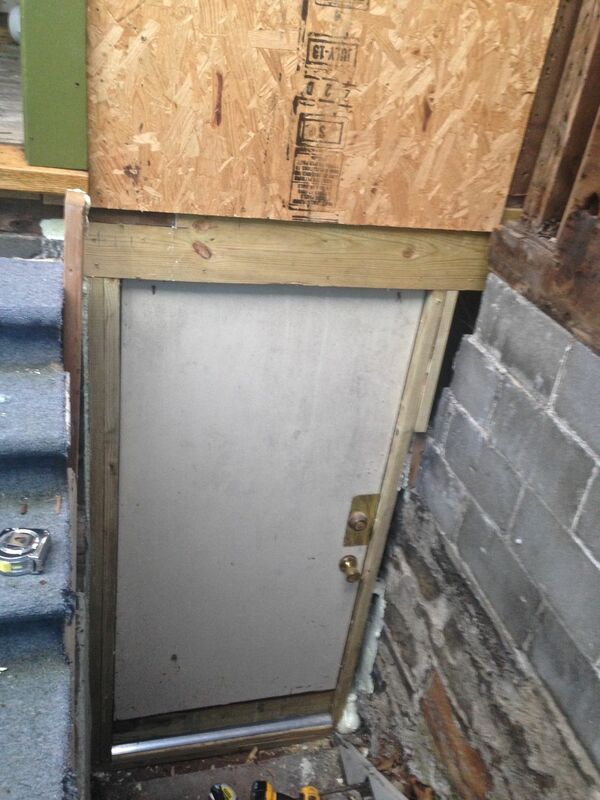 The steps to the basement reached a kinda vestibule. There were sheetrock walls on two sides, and a solid-core door made of particle board. When the vestibule had a roof over it, all was well. 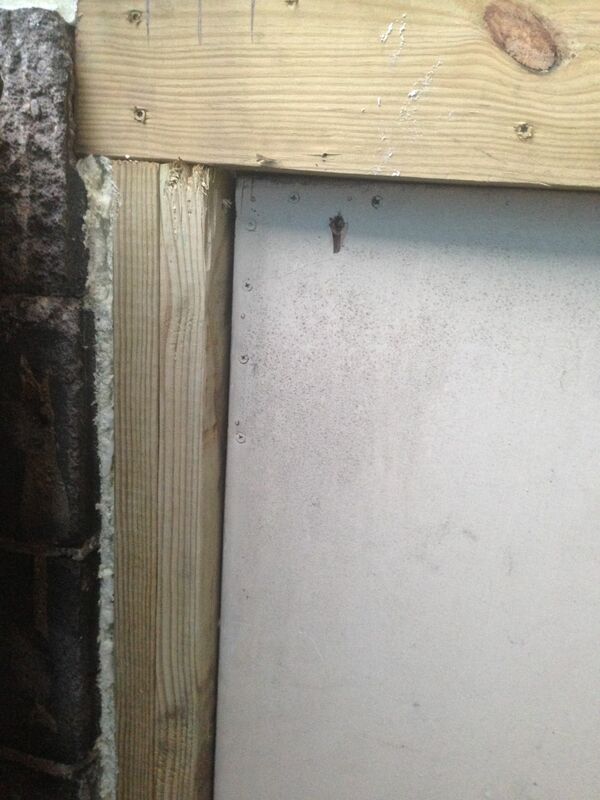 But sheetrock and particle board react very poorly to rain. After almost two years, each was not, ah, looking their best. Moroever, the shed also provided for protection against wind and cold. With the shed gone, the vestibule was SO not air tight, and installing new plumbing (the carriage house will be totally re-plumbed) was impossible with ICE a certain reality. But what needed to be done would only be temporary. My GRAND PLAN for the carriage house is to create an interior basement stair. So, the current basement entry will be replaced down the road. 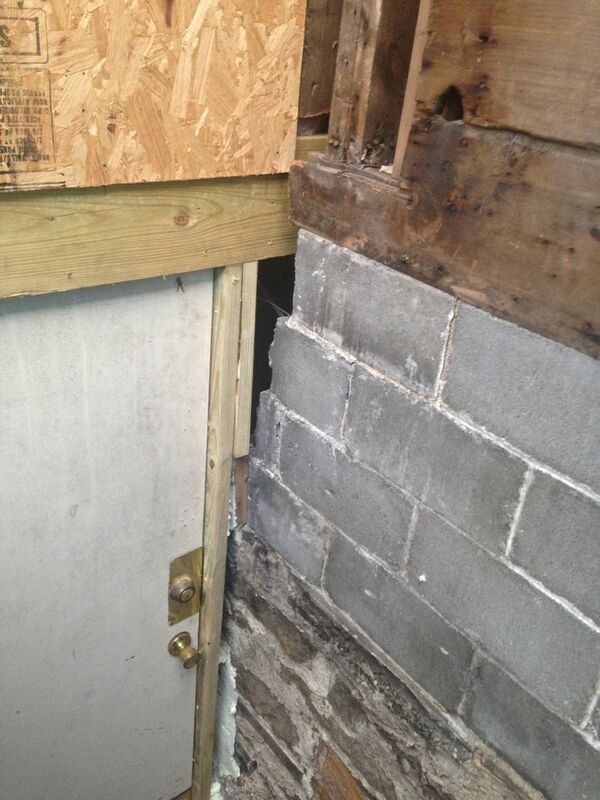 As such, any new work will later be torn out, and the current basement entry will be filled in with concrete block. This meant that instead of creating the most fabulous ever basement entry (as would normally be my wont), I would do The Very Least. As I am a guy who defaults to IOT (insanely overdoing things), doing The Very Least feels really really strange. I removed the vestibule. The moldering sheetrock came out by hand; no tools required. Then I moved the door forward, so it aligned with the exterior wall. The bottom of door had been reduced in length many years previously to fit the not-quite-full-height ceiling. This had been fine for decades, but the particle board core had SOAKED up rain for the last two years, expanded, and was flaking apart. Loath to spend money simply replacing the door (as I will later throw it away), I cut off the bottom six inches, and attached a piece of 2×6 pressure-treated lumber (the darker strip at the bottom). OK! Brilliant! The frame is new, and also treated wood. I also added an aluminum weather threshold at the bottom, something I would not in a million years normally add to a historic house. The new frame buts against uneven stone and concrete block. This being the modern age, I squirted in spray foam, a miracle invention not available in 1894. Then I cut off the excess, to convince myself that all this work was actually something requiring a high attention to detail. I even then stood back and marveled at the skill required. 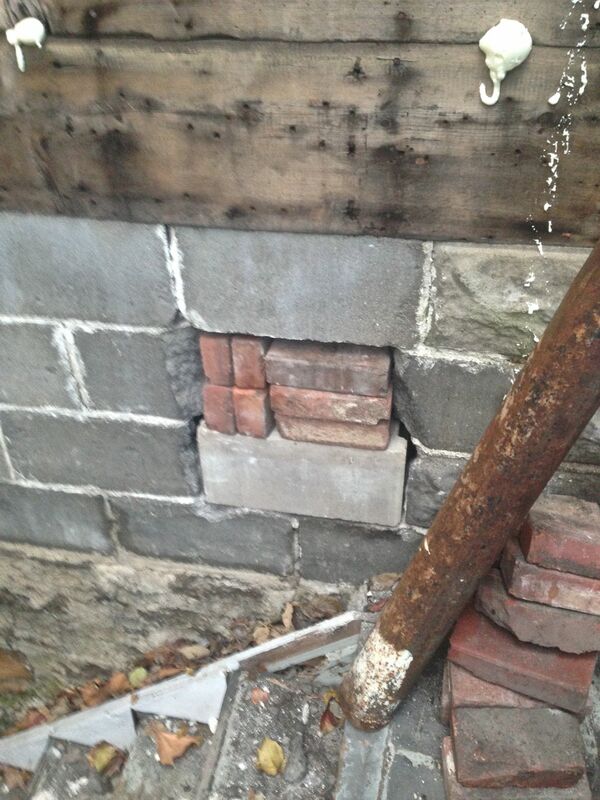 The concrete blocks date from the 1921 conversion, but a few bits are missing, and some infill is required. This breathtaking adventure will be detailed in a later post. Stay tuned!!!!!!!!!!! And more missing concrete blocks. This hole was for a HVAC duct which supplied the now gone shed. When this exciting, dynamic, and challenging work is soon completed, I will no longer have wind rushing into the basement. I will be greatly relieved. Next week I will also add downspouts, to channel rain AWAY from the house rather than INTO it. This, too, will cause great relief. Before I begin in earnest on creating the kitchen for the carriage house, I hope my prayers are answered for a green sink. Thanks for the update. As my husband says, If it was easy, someone else would be doing it. We did an Victorian restore, it was not easy. I see no reason we all can’t focus on a green sink for the Carriage House. It will be done. Ross your writing style makes even the most boring content interesting to read. Keep it coming! You are a peach! Thank you! I was loath to even do this post because the subject matter was SO prosaic. But when I started writing, a silly hand took over the typing. Oh the evil Ross has surfaced again. He is still lusting (mortal sin) for that woman’s green sink and now he has sunk so far as to make it God’s responsibility to influence her to sell (or worse give) it to you. Satan is at this very moment building an exact replica of the Cross house in a corner of Hell but he’s building it out of chipboard, rotten sheetrock, spray foam, plastic and siding it with vinyl siding. You’ll burn in Eternity for this one. Just go ask for the frigging sink – take money.